The iconic Curtis P40 Warhawk/Kittyhawk has held the imaginations of many a would be fighter pilot. Its fearsome shark tooth grin motif made famous by the American Volunteer Group is known worldwide. 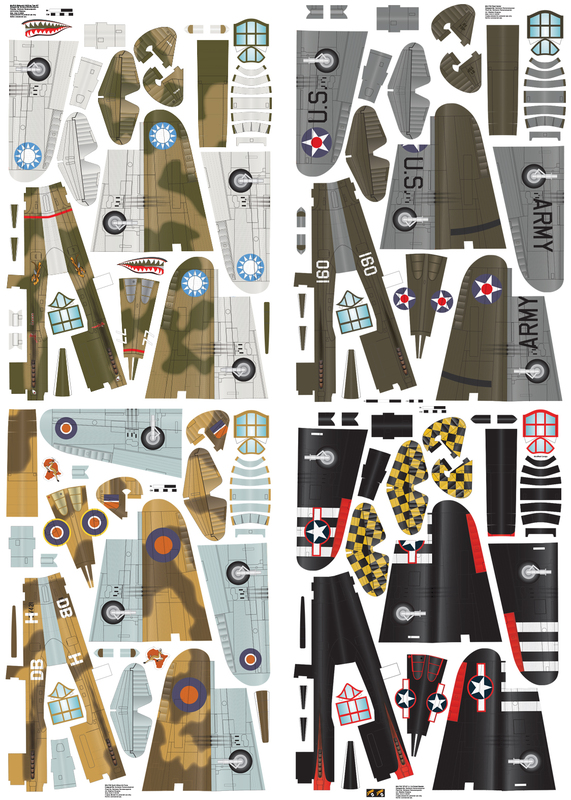 These four skins depict a range of P40 color schemes and are based on plans designed by community member MiniacRC. Check out the links below for his original plans, build guides and flight video for this awesome P40 model. 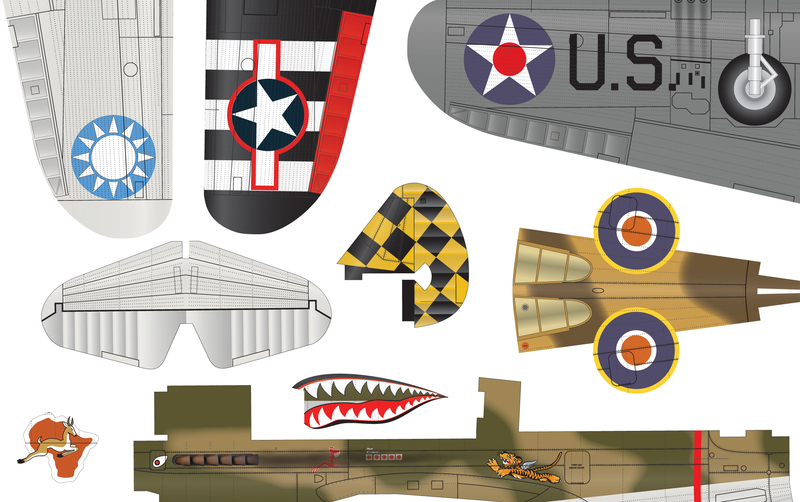 Also don’t forget to check out his B25 Mitchell (Skins to come) and JU87 Stuka (Skins done need formatting) Skins are on a single Arch D 24X36 sheet. The Flying Tiger skin is that of Robert Tharp (R.T.) Smith aka "R.T.", "Tadpole", "Bob" was a World War II fighter pilot and ace, credited with 8.7 or 9 Japanese aircraft while fighting with the American Volunteer Group (Flying Tigers). Enough Said. The standard olive drab and light grey colour scheme P40 is typical of US Army Air Corps aircraft at the entry of the US into World War 2. This skin bears the number “160” the aircraft 2nd Lieut. George Welch flew on 7 December and belongs to the 15th Pursuit Squadron. The Air Corps officially credited Lieut. Welch with 4 “kills” and several others damaged. The stunning black and red P40 depicts. Col. Robert Baseler’s P40F, CO of the 325th FG, Mateur, Tunisia, Sept. 1943 The 325th Fighter Group, known as the "Checkertails", became a highly combat efficient unit accounting for 27 aces and amassing over 200 enemy victories. Based near the Mediterranean (Tunisia and Italy), the unit adopted a highly visible, yellow and black checker pattern across the tail of their aircraft. Lt. Col. Robert Baseler would score 6 victories against the Luftwaffe in both P-40s, and P-47s. He named all of his aircraft "Stud" - including "Big STUD" for his P-47 Thunderbolt and "Little STUD" for his P-51 Mustang. The striking black and red paint scheme of Stud P-40 was actually painted after the aircraft was taken off of combat operations to hassle high-altitude German reconnaissance aircraft. Although not true to the original "Stud", invasion stripes were add to help with orientation. Maj. D.B. “Hoefie” Hauptfleisch (OC 2 Sqn) flew Kittyhawk Mk I, Ia with personal code DBH April 1942-June 1943. 2nd Squadron is a squadron in the South African Air Force which was formed Active 1 October 1940 to current. The squadron has a long history, having been involved in every single combat action in which the SAAF has taken part. During the Second World War it made a name for itself in the battles for East Africa, before distinguishing itself in North Africa as part of the Desert Air Force, and later in Italy. Maj. Hauptfleisch shot down Stuka pilot Lt. Heinz-Georg Migeod. Migeod was shot down in Libya, 11/11/1942. After the war Mgeod relocated to South Africa where he met “Hoefie” Hauptfleisch and they became good friends. “Hoefie” passed away in 2009 and Heinz in 2010. Migeog once said that the incident on 11 Nov 1942 was very funny: “a German of French descent was shot down by a South African from German descent in an African country occupied by Italy” There is your daily dose of irony. I will be depicting Lt. Heinz-Georg Migeod Stuka in a skin coming soon. Build both, and you can then reenact their meeting in 1942! Please download and read the “Read Me” PDF for more info.